The game banks on the premise that office workers do this kind of stuff in the real office setting to while away time – that is crumple a scratch paper and toss it into a trash can positioned in front of them at several feet away. Imagine that game on your iPhone and you have Paper Toss – the iPhone game. So, the gameplay is pretty simply, toss (actually it’s more of flick) a crumpled paper towards a trash can positioned at varying distance from you. It might seem simple at your first try but wait till your second try when a fan will appear to distract the path of the crumpled paper towards the trash can. So, the best way to conquer this obstacle is to adjust the angle of your flick relative to the strength of the fan and the projected distance that it will try to blow away the crumpled paper. It’s really just a matter of adjusting the direction of your flick. In due time, I’m pretty sure you’ll master the trick. The game offers three difficulty settings – easy, med, and hard. Plus there is also a bonus game level called airport where the game takes place in an airport instead of the office. You can also choose to play with or with game sounds as well as check your scoring history. After playing the game you can submit the scores to the game’s online scoreboard. Submission of score will not open up your iPhone’s Safari browser but instead open a new window inside the game. You will need to register before you can submit your scores. Overall, the game is pretty light. The main objective of the game developer was to make a no-frills-just-the-basic paper tossing game. And they’ve achieve it quite successfully. When I downloaded this game I wasn’t really expecting to enjoy it that much. I was only intrigued by how far the game would go in terms of features – graphics, sounds, gameplay and all. But I was pretty surprised to find myself playing it over and over again. It’s pretty addictive like I said. And it is also a diversion especially when things get boring in the office. But of course you can play it anytime you need to while away time. 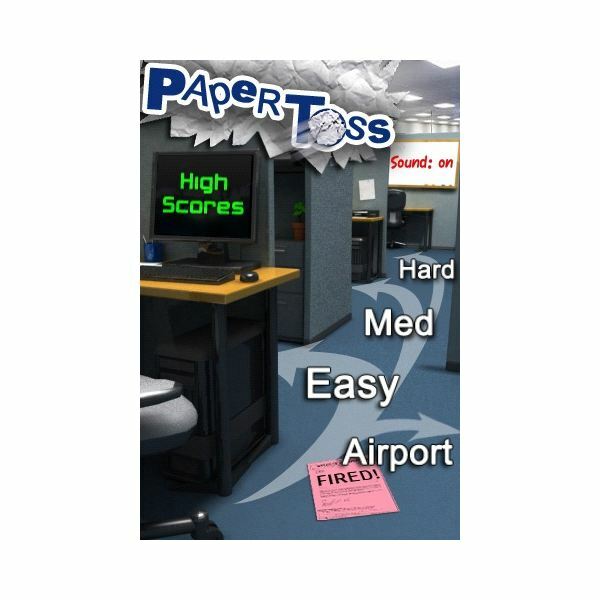 Paper Toss is available at the iTunes App Store as a free download. It’s a great game to have especially if you’re looking for something simple and yet fun to play on your iPhone. Screenshot of Paper Toss by Backflip Studios.